This will cause that gdxls will only be called if input.xls has been changed since the last time this conversion was performed. Added semi-continuous variables so we can translate lp-solve models with such variables. Have not checked if fixed semi-continuous variables work identical at both sides. There is confusion about the meaning of this. I was stumped when a client of mine reported this error. I expected an error message about version mismatch in such a case. I have two different formulations of a linearly constrained NLP (i.e. the objective is nonlinear). The difference is how we formulate the objective. In the next fragments x is a variable and c and e are parameters. There is probably something wrong how GAMS deals with the derivatives for the first version. I passed this on to GAMS so they can investigate. The real model is much larger (> half a million variables), and then this difference becomes really significant. One version can solve the model quickly to near optimality (with Mosek) and the other version is not able to finish in reasonable time. I.e. we have 4 sets of 2 numbers 1,2,3,4 where between number k we have k other numbers. 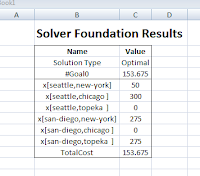 With Microsoft Solver Foundation it is easy to create a constraint programming version that solves much quicker and in addition it is easy to add a simple user interface. The gdxls tool is a Java based alternative for GDXXRW on Linux and other non-Windows operating systems. Besides converting xls→gdx (as described in http://yetanothermathprogrammingconsultant.blogspot.com/2008/10/gdxls-read-xls-files-on-linux.html) we can also convert gdx→xls. We run the trnsport model from the Model Library and save the results in a gdx file. We then extract the c(i,j) parameter from the gdx file and write it to the spreadsheet in different formats. Note that we use a numbered suffix in the properties file to indicate which options belong to the same item. No suffix is identical to suffix ".1". So we have three items to process and they are numbered 1,2,3. 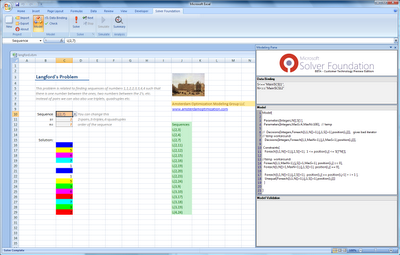 The result rendered by Open Office Calc looks like the picture shown below (click to enlarge). The GAMS tool GDXXRW is not available under Linux, Unix and OS X. As I needed to have this functionality in some projects, I developed a Java based alternative. Technobabble: The tool is using GCJ,GCC and CNI so it should be easy to port to any platform where the GNU compilers GCC and GCJ are available. The tool gdxls can read xls files on Linux (and other Unix-based operating systems) to generate gdx files. Similar to GDXXRW it works as described below. Another posting will describe gdx to xls conversion. 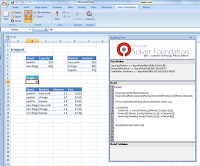 In http://yetanothermathprogrammingconsultant.blogspot.com/2008/10/magic-squares-with-ms-csp-solver.html we describe a CSP formulation using the Microsoft Solver Foundation tools. Here are some GAMS formulations using a MIP. Instead of x(i,j) we use a single index: x(i). That makes it easier to model the "all-different" constraints, at the expense of making the row, column and diagonal sums more difficult. The latter complication can be alleviated by using a mapping set that maps between the two representations. all add up to the same total. unique(i) "make sure each x(i) is unique"
yrow(i)   "row sum of y"
ycol(j)   "col sum of y"
extra1    "extra constraint for performance"
extra2    "another redundant constraint for performance"
This version is using or-constraints to model the all-different condition. The N=5 problem is already very difficult to solve. Using the code from http://poi.apache.org/ I can now read and process Excel XLS files on Linux (and Mac). Note: this code implements the Compound Document Format, so does not depend on Windows. This model generates Magic Squares (http://en.wikipedia.org/wiki/Magic_square) using the Microsoft Solver Foundation Excel tool. As we have no objective, this can be formulated as a constraint programming problem. This makes it easy to use the alldifferent constraint (using the unequal construct in OML). This remains a difficult problem: only quick solutions up to N=5. Update: I tightened the symmetry breaking constraints and used a different CP heuristic (Domain over Weighted Degree). Choosing the correct heuristic was not done by deep insight but rather trial-and-error. This allowed me to solve even up to N=10 quickly. For one of my current projects CNI looks quite attractive. Update: used GCJ/CNI to implement GDXLS (see: http://yetanothermathprogrammingconsultant.blogspot.com/2008/10/gdxls-read-xls-files-on-linux.html and http://yetanothermathprogrammingconsultant.blogspot.com/2008/10/gdxls-write-xls-files-on-linux.html). Much more fun than JNI! After Microsoft entering the Math Programming Software market, there also will be more solver competition at the high-end: http://www.gurobi.com/index.html. These guys were main developers of Cplex, so I would guess they aim towards a similarly positioned product. This is of course a very welcome development for us modelers. I was given a very large convex linearly constrained model (exceeding half a million variables). The "standard" NLP solvers (Conopt,Minos,Snopt) were very slow on this model, not even being close to optimality after hours of working. Mosek solved the model very fast, but not to optimality: Solution status : NEAR_OPTIMAL. Here x0 is the current value of x. Basically a Taylor series approximation of the objective. This actually converged rapidly to an optimal solution we could verify with Conopt. (Conopt complained about some reduced gradients being too large, but could not improve the solution further). What this algorithm lacks in refinement it gains in simplicity: just a loop around a solve statement. Implementing such a problem specific algorithm is easy to do in GAMS using its procedural features (the complete code in this case is less than 20 lines), and for the most difficult problems this often can help. We further benefitted from having access to multiple NLP solvers (in this case Mosek and Conopt). > Error 1231: The network location cannot be reached. The GAMS IDE uses the "My Documents" directory to store an initialization file. It will refuse to run if this directory can not be accessed. Usually this directory is on the local c: drive, but some system administrators may choose to have this directory on a network drive. The result is that the GAMS IDE will not start if your laptop is not connected to the network, even if GAMS itself is installed on the local c: drive. When you click on this shortcut the GAMS IDE will use the c:\projects\gams directory to store the initialization file. Make sure this directory exist! The IDE Help has some notes on this (not being able to start the IDE, you would need to click on gamside.chm in the GAMS system directory). The GAMS/Ipopt log always somehow reminds me of drunken noodles because of the misaligned headers. I would guess the formats are a little bit too tight for some platforms. The log file may contain additional information. Unfortunately if you run GAMS from the command line (e.g. by Linux users) the log is not saved. (The IDE under Windows will save a copy). This Max Likelihood Estimation example includes forming of confidence intervals. Standard errors are found by inverting the Hessian and normal quantiles are calculated using a minimal CNS model. This kind of analysis is only possible with new features in GAMS. However, it remains kind of klunky compared to Matlab, Gauss or SAS. The GAMS approach may be useful nevertheless, e.g. when using as part of a larger GAMS model (in which case calling a different system may be cumbersome), when the problem is very difficult (in which case stronger NLP solvers and automatic differentiation can help) or when you don't have access to these other systems. The Microsoft people react very promptly! The listing files does not convey any messages indicating the reason for stopping. We have observed this before, but this bug has not been fixed as of now. If a solver stops it is important to say why. Just simple-mindedly reporting "terminated by solver" makes it very difficult to fix whatever the reason is for the termination of the job. Note: the log file did not help me either with information why the solve was stopped. These screendumps show how the trnsport.gms model from the GAMS model library can be expressed in OML. Note that all data manipulation is done in Excel. OML does not allow for any data manipulation. That means that data preparation (model calibration, balancing, aggregation, set manipulation etc) needs to be done outside the modeling language. The same for data manipulation during report writing or when developing heuristic algorithms instead of a single solve. Most of my GAMS models include a large part doing data manipulation. Often more than 80%. It would not be as convenient to be forced to move all data manipulation out of the modeling language and into a database, or spreadsheet. I have not figured out yet if there is a mechanism to handle exceptions in OML like the $ such that operator in GAMS. > I am looking for a good visual tool to compare gams source files. > handle this most conveniently in GAMS. 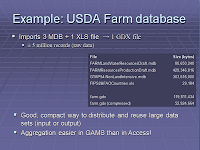 I usually handle this is a separate GAMS model that imports from all these data sources using tools like MDB2GMS, SQL2GMS and store the data in a GDX file. Then your main GAMS model can read this GDX file. This has several advantages: your main model can focus on the optimization model itself, and will not be cluttered by all data handling and conversion code. In addition the intermediate GDX file is convenient as it now is a single self-contained file. This makes it easy to share with others, to use in other related models, to be inspected in the IDE etc. An additional advantage is that the GDX file functions as a snapshot. 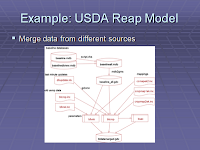 Even if later on databases are changing, you have a (hopefully consistent) snapshot of all input data, that allows you to run the model against a stable data set. Attached are sheets illustrating this concept for some very large models.